I have injured my toe as you might have read in my previous post, and have completely refrained from jogging this whole week. My body clock however refuses to acknowledge my toe and still insists on waking me up by 5:45 every morning! So instead of forcing myself to go back to sleep, Tuesday morning I took the opportunity to enjoy the cool morning breeze and to capture the sights and sounds in an unhurried way, in my Canon 550D SLR camera, which was a surprise gift for me from my husband around two years ago. I also wanted to sharpen my photography skills after having done a beginners SLR course sometime ago in London. So I waited till 6:30 am since it was still quite dark at 6, and just as I was heading off my younger son woke up. He was still a bit groggy at first but when he saw me fully dressed he was suddenly wide awake and I knew that I was about to have a companion for my walk, whether I wanted or not! I quickly got him ready and in five minutes we were both out of the house, heading towards the Wah Fu seafront. As part of my elder son’s class homework, I had just done a project on the ”Impact of Migration –Wah Fu Estate” along with him. We had done quite a bit of research online, had gone through some old 1950s photographs and I could visualize what the area would have looked like then with nothing but the mountains and the sea. 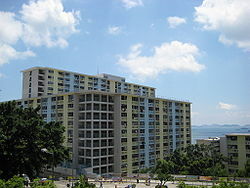 Incidentally Wah Fu Estate was built in 1967 by the Housing Authority of HK to meet low cost housing needs of the masses who lived in unsanitary conditions. It was one of the first housing estates that was built with a then-innovative concept of town type housing with facilities like car park, library, schools, post office, wet market, shopping arcade, etc. Wah Fu Estate was built on the principles of feng shui with its back to the mountain and its front to sea and as we walked down the streets I could picture a much less populated, much less polluted Wah Fu with fresh just-constructed buildings and the residents all living in harmony, a part of one community. While researching online we came upon this lovely video depicting the life of a little girl who spent her carefree childhood growing up in this estate. It is a part of an 8-video series produced by Housing Authority depicting the feelings and experiences of people living in public housing estates. My son and I continued down a quiet shady path lined with trees, he running ahead at full speed and me taking random photographs of trees, buildings, sky or anything that caught my eye. We met a cute little friendly poodle who took a fancy to my son and we played with him for some time before continuing our walk. We soon passed a small red Chinese temple where some incense sticks were burning outside. At this time in the morning everything looked so peaceful and even the Chinese locals who look so serious during the day seemed extremely friendly. Soon we were exchanging ”Jou Saans” (Good Mornings) with each other, some even said it in English! All of them were busy doing some sort of exercise ranging from stretching, breathing deeply, rubbing and tapping their joints to walking backwards! When we reached the sea front, some were even swimming in the sea along with passing boats and ships, right under a sign which said ‘Do not swim or play at this seashore!’ This is the place which caught me off guard, when I had first come here with a friend, with its vast collection of Chinese Gods and Goddesses all spread across the slope, cemented in the ground, facing the sea with incense sticks burning around them. I had later read somewhere that the idols are brought here when they become old and are no longer needed, to get a lengthy retirement by the sea! We walked on and by now I was looking at my watch, as this walk was taking a bit longer than what I had anticipated. But I did want to finish off with the waterfall, so we continued our walk at a faster pace. We passed a playground, an exercise area for the elderly, public tennis and football courts, all in the open, by the sea, for the residents to use. 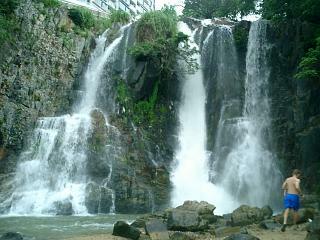 We kept walking and finally reach the best part of our walk – the waterfall. It is not that the waterfall area is breathtakingly beautiful, it’s just that you do not expect to find a quiet oasis in the middle of residential chaos right above! My son gets busy throwing pebbles in the water while I capture some more images in my camera. We were quite late by now so we force ourselves to leave the place and head back home. On the way as we passed the shopping arcade, the post office, the library, I realised how I have come to depend on this little township to meet my daily needs and how slowly and steadily it is occupying a soft corner in my heart! I loved the video clip, took me back to my childhood when we had so much fun with building friends doing nothing but running around and making up games. Should you be walking about so much with your injured toe? Hi Mehernaaz, replying to this comment after a long time so apologise for the delay. Yes the video clip was quite sweet so I had to include it here. Reminded me of my childhood days too. I am happy to find this blog here. You have providing nice information and very use of diffrent pictures and video clips. I really appropriated your work. Feel free visit my blog here http://kangraavalley.blogspot.in/ and do not shay for comments.